For most of 20th century scientists believed that brain develops during a critical period during early childhood and then remains relative unchanged. However, in the last few decades it has been shown that many aspects of the brain can be altered (or are “plastic”) even into adulthood. And yet, we find it difficult to change our habits. We see that people don’t change their views especially their core beliefs easily. This is what Norman Doidge refers to as “Plastic paradox” in his book “The brain that changes itself”. Doidge considers this riddle one of the most important lessons of the book. If our brain is really like a play-doh, then why is it so difficult to change? Let’s explore this riddle in this article. 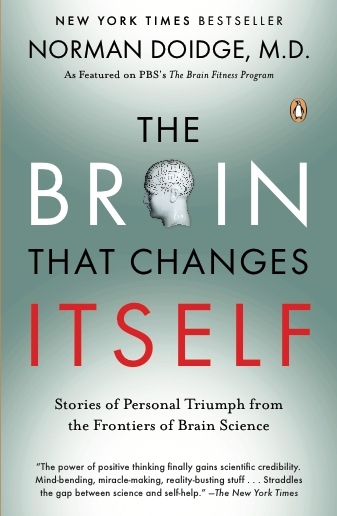 One of my favourite stories from the book revolves around the neuroscientist Paul Bach-y-Rita. In a now-famous experiment in 1960s he demonstrated that vision can be substituted by other sensory input such as stimulators touching the back. Bach-y-Rita published his result in Nature in 1969 and coined the term “You see with your brain, not with your eyes”. In this experiment, he had a blind person sit on a dentist-kind-of chair. 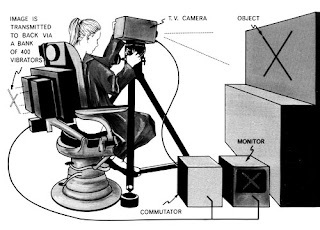 The back of the chair was replaced with a matrix of mechanical vibrators. There was a camera mounted on top. Depending on the object captured by the camera, certain set of vibrators would touch the back. (see the picture) It was found out that the visual cortex of the blind person’s brain began to process the input coming from the skin (back stimulators) and the person began to “see” the objects. This demonstrated that brain could reorganize itself. Subsequently scientists have found that brain undergoes massive reorganization when one falls in love for the first time and when one becomes a parent for the first time. At the microscopic level, it has been shown that every learning experience involves lasting changes to the brain. In fact, every thought is changing the brain synapses at a microscopic level. Assuming we have 50,000 thoughts a day, your brain is undergoing 50,000 microscopic changes in a day. That’s a lot of change. Ideally, we should be in a good position to change anything – quit smoking, follow a diet, stop worrying unnecessarily etc. But that’s not our experience. What’s happening here? To explain this “plastic paradox”, Doidge uses a metaphor originally from the neuroscientist Pascual-Leone of Harvard. It says that the plastic brain is like a snowy hill in the winter. When we slide down the hill for the first time, we will create a small path. When we come down the second time, we will find it easier to follow a path closer to the first one. And if we repeat this enough, it would create a speedy track, kind of a highway. The highways serve a useful purpose as we carry out umpteen tasks on auto-pilot such as walking, talking, driving etc. However, the highways also pose a drawback. As the brain gets used to using the highways, who wants to pave a new path? It is too much of effort. That’s how we get stuck with our habits. So what does one do? Well, Doidge doesn’t offer any solution in his book. However, this is what I feel based on my experiments and I could be wrong. A paradox gets resolved when attention is paid to the inherent inconsistency. Perhaps a good place to start may be by paying attention to the thinking process as it is sliding down the “speedy tracks” especially when it is not serving any useful purpose such as the case of worry, guilt, blame etc. Who knows? This might open up alternate paths. And that might take us to the uncharted territory and lead to creative insights. I found the book helpful in understanding various ways in which neuroscience is exploring the boundaries of brain's plasticity.